A version of this article was previously published on AutomatedBuildings.com. In April, we released the BASpi-I/O board for Raspberry Pi, which turns the already powerful Raspberry Pi3 into an extremely capable 12-point control device with web-based configuration, universal IO, simple to use drag and drop programming and industry standard data communication and control protocol — BACnet. Many of our customers were already familiar with the Raspberry Pi platform and were early supporters of our concept of "open software and open hardware." 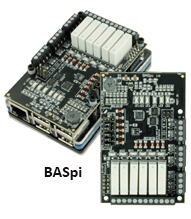 Plus, a new audience of micro PC/Linux enthusiasts and DIYers became interested in the product because the BASpi gives users a truly open controller they can easily set up and use. Now that the product has been on the market for a month, users are sending us reports on how the product is being used. "Several customers are using the BASpi for home automation projects, which we expected," said Zach Netsov, Product Specialist at Contemporary Controls. "And on the training side, the reasonable cost and ease of use also allow technical school teachers and DDC trainers to use it for their students as a Sedona and BACnet trainer. We also have customers using the BASpi as a "bolt-on" controller on jobs where they need extra BACnet or Sedona-controlled points." For example, one BASpi customer and Raspberry Pi enthusiast, John Potpolak from Electronic System Services, Inc. (ESSI) in Fort Myers, FL, has deployed the BASpi as a fan coil unit (FCU) controller in a chiller pump room at a middle school in Florida. He wrote the FCU control application in Sedona and received the scheduled setpoint from a JACE supervisory controller over BACnet/IP. The BASpi has 24 virtual BACnet points in addition to its twelve real points. The FCU provides both heating and cooling using simple 2-position valves and a fan controlled by the BASpi's binary outputs. Four universal points are configured to read three 10k type 2 thermistors and one binary input for fan status. When asked about his experience using the BASpi, John said, "It only took 2 hours or so to install, and I did not run into any issues. Very cool product, worked very well, and it has been running for over a month now in this nasty hot pump room. I would certainly consider it for my future projects." Two versions of the BASpi are available. One is the BASpi I/O board for those people who already have a Raspberry Pi and are experienced with programming it. The other version is an entire system, which includes the Raspberry Pi 3 board, the BASpi I/O board, an industrial grade µSD card with the pre-written image, international power supply, and an enclosure case. The I/O board, plus the firmware files provided by Contemporary Controls, turn a Raspberry Pi into a BACnet-networked, Sedona-programmable controller with 6 universal inputs, 6 relay outputs, and 24 BACnet virtual points. The BASpi includes a Sedona Virtual Machine (SVM) that can be freely programmed using Sedona's drag-and-drop methodology of assembling components onto a wire sheet to create applications. As part of the free BAScontrol Toolset, Contemporary Controls provides a free Sedona Application Editor to assist with programming as well as a project backup and restore utility and an emulator. Besides being an open Sedona controller, the BASpi is BACnet/IP compliant. The configuration of BACnet points is via web pages. Time-of-day is handled with an NTP server. With both Wi-Fi and Ethernet ports on the Raspberry Pi, it is possible to be attached to a BACnet head-end on the Ethernet port while programming the controller over Wi-Fi.